With zesty seasoned chicken, juicy tomatoes and cheese, this Tex-Mex taste sensation gives you plenty of variety. Mix dressing and cumin; set aside. Place tortilla strips on microwaveable plate sprayed with cooking spray. Microwave on HIGH 1 min. ; set aside. 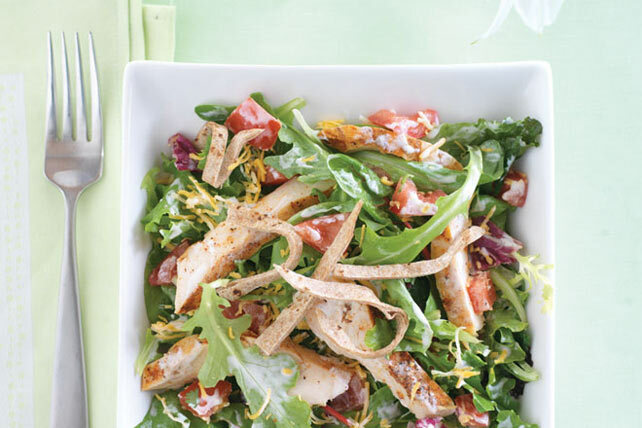 Toss greens with chicken and tomatoes in large salad bowl. Add cheese and dressing mixture; mix lightly. Top with the tortilla strips. To serve in tortilla shell, spray outside of small microwaveable bowl with cooking spray; place upside-down on paper towel. Top with 1 whole wheat tortilla. Microwave on HIGH 2 min. Cool. Remove tortilla from bowl; turn right-side up. Fill with salad just before serving. This easy-to-make Tex-Mex salad is not only flavourful but also provides a good source of vitamin A from the salad greens.